I just want to pass on a hello to my followers and assure you that very soon, I will get some instructions on how to connect with you. I am so behind the times with respect to navagating this blog, responding to comments and also signing up to follow others. Anyone who wants to send advice, please do so. Also, I really resent the time this blog takes away from actually holding a paintbrush in my hands. 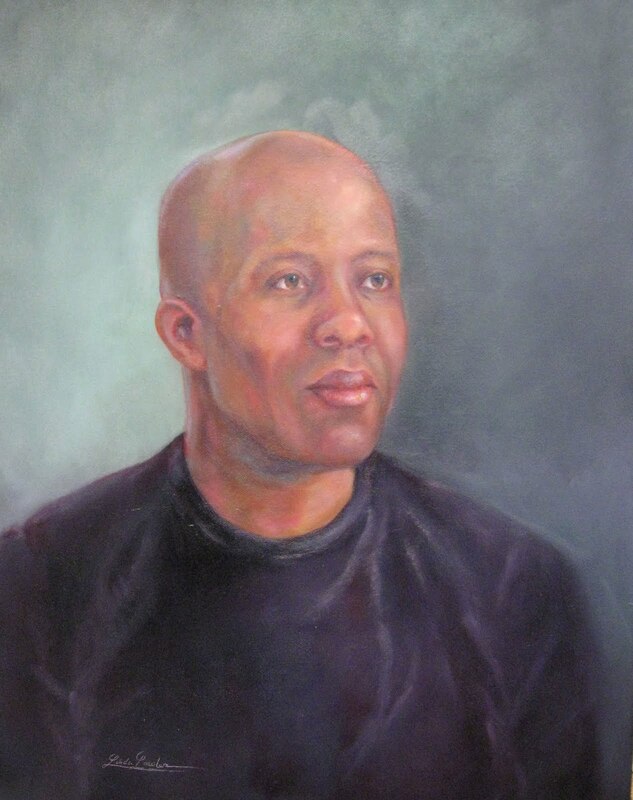 I recently finished this portrait of William Tolbert. The photo flash has washed out the colors somewhat. I will try to reshoot the picture so that I can add this to my portfolio. William has left our area to return home and help his mother with the family business. We will all miss Bill and wish him the very best. Thanks for sitting for me, Bill! 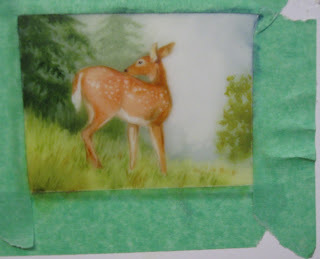 This little miniature is only 2 and 1/2 inches tall by 3 and 1/4 wide. I thought it was finished until I posted it here. I can now see that my values are not wide enough in range. I would like more depth in the painting also. I used oil on Ivorine for this miniature. I used very little sanding film this time!!!!!!! I did this preliminary sketch on Monday for my next major painting, "Venus". The model is so photogenic and so natural with posing for me. I started with a concept to go with my Gods and Godesses theme. All that went out the window when I started the photo shoot. She just naturally came up with this pose and I liked it so well that I am going to end up doing two different Venus concepts. 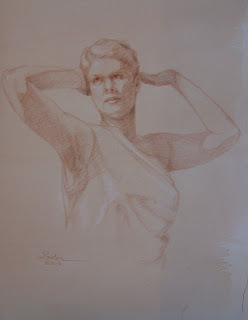 After reviewing the photos, I have pulled out several poses and decided to do a few preliminary drawings. I just don't draw enough these days and it is a must to have good drawing skills. My next step is to get the pose roughly placed on the toned linen canvas. Once that is done, I will call the model back to sit for the initial lay in of the painting. At that time, I will adjust any areas where my photos lied to me about her anatomy. I also had a photo shoot with another model for the Saint Alice of Assisi painting. More on that later. I used to think that I was a pretty darned good artist. 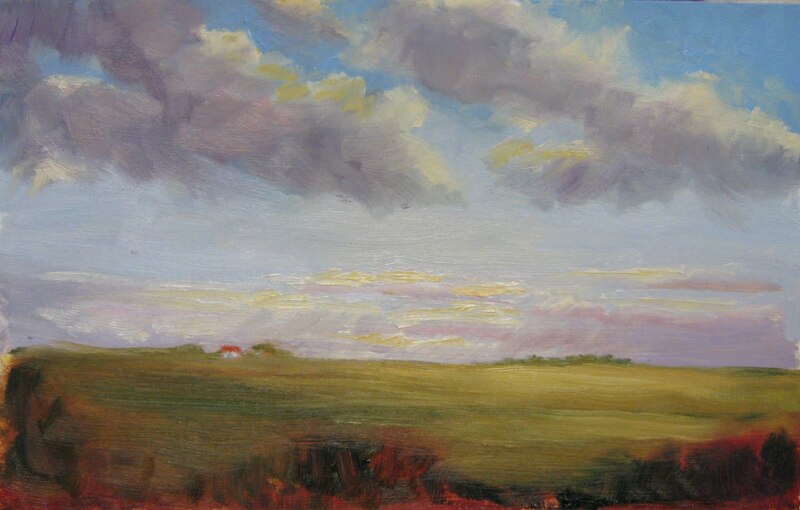 After taking Sara Linda Poly's plein air classes, I now know otherwise. This is one of the class exercises she has had us to do and I am not at all happy with my feeble attempt you see here. Although she said I am doing good, I can only see yukk. I guess that I am so used to detail and my own style that it is very hard for me to loosen up and paint quickly. 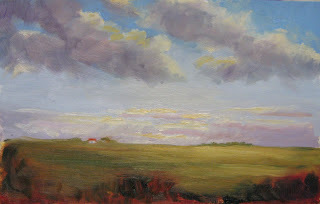 I have painted en plein air many, many times, but with my own approach. I will say this....the colors in the this little painting are approaching what I had hoped to evolve into. I will frame this little study and hang it in my home studio as a way to humble myself when my ego starts to get out of control. Well, it's almost finished. The latest copy of the Foxhounds Dream is the one on the right. I have not even started the horn or rope at the bottom left. There is still plenty to do. And I thought I was almost finished the other day. I had this portrait commission to do this weekend and it turned out so well and I liked it so much that I decided to do another in a similar pose for my own portfolio. I think it is a nice example of a charcoal portrait and I added a touch of pastels to it. 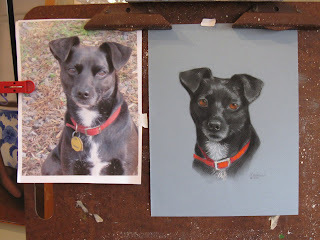 This is Alpha, a weekend resident in Little Washington who visits my gallery on a regular basis. Alpha and I have become very good friends. Would you believe I just noticed the comments button under my postings. I suppose I will have to figure out how to view and reply to your comments if you send them. I am such a Technologically Challenged Dinosaur. OH! Speaking of Dinosaurs, James Gurney the creator of Dinotopia is exhibiting 55 of his paintings at the Delaware Museum until May 1, I believe. I have it on my calendar to go see this exhibit. I do love sci fi art! 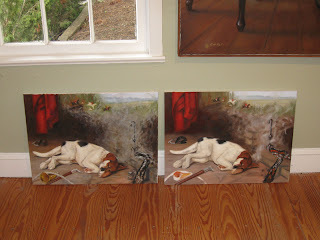 I am finishing up the fourth request for a Foxhounds' Dream painting. Whew! I think I could do this in my sleep now. There are photos of this copy in my earlier posts. 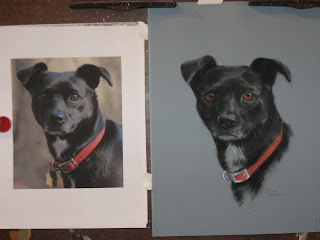 Yesterday I did a charcoal portrait of a lovely little dog named Alpha. 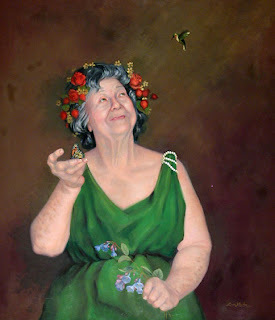 It was one of those days when the portrait pretty much painted itself and if I say so myself, it is sooooooo beautiful. My husband Brett is right, "When you love a subject, you do your best work". I do adore this little dog. 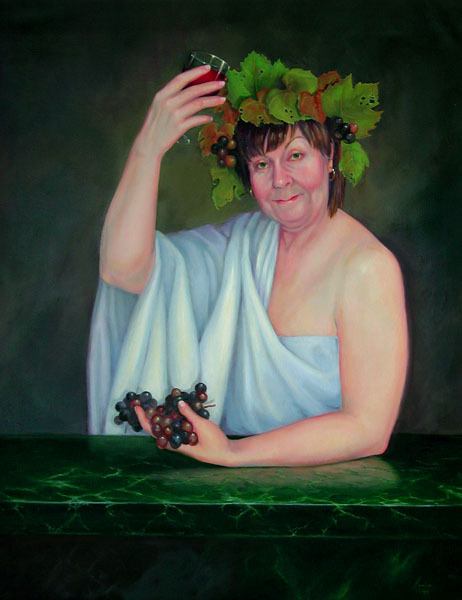 I am so happy with the portrait, I am going to do a second one today just for my portfolio and display at the gallery in Little Washington. I promise to post some pictures tomorrow. 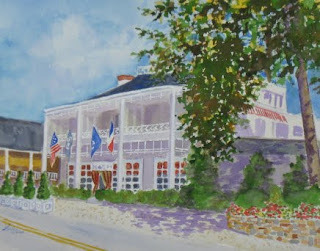 This is one of four new images available in series 2 of the "Little Washington" notecards. Also in the set is an image of Town Hall, Heritage House B & B, and the original log cabin on Main St.
Series one featured Ice House Gallery, the Courthouse, Mrs. Cox's Tavern and Trinity Episcopal Church. Each box has two of each image, eight cards for $15.00.